I love vegetables; grilled, roasted, sauteed or raw, just hand me some in-season vegetables and I’m a happy girl. These Summer Roasted Vegetables are just another way to enjoy the produce of the season that you can serve as a side to any of your barbecue favourites. And I know what you’re thinking, roasting vegetables in the summer – are you crazy? While grilled veggies may seem like a more common way to enjoy the bounty of the season, roasting summer veggies is also simple and delicious. I love adding garden fresh tomatoes and red peppers to add that nice summer touch that differentiates these from your typical potato, carrot and onion roasted vegetables or winter root vegetables that we know and love. I love serving roasted vegetables because the vegetables flavours become more concentrated and sweeter when they are roasted in the oven. For this recipe, the flavour comes from the vegetables and I’ve also loaded in a ton of garlic and fresh herbs. I opted for fresh thyme in this recipe because it’s one of my favourite herbs that is available in the summer, thus it made the most sense for these summer roasted vegetables. What adds the easy touch is the use of Cookin’ Greens™ by The Toby Brand™. Cookin’ Greens™ are a range of products of dark-leafy greens. The greens are farm picked and within six hours, double-washed, double blanched, chopped and quick-frozen for your convenience, locking in all of their flavour and nutritional benefits. I was able to throw in a bag of the Designer Mix – chopped spinach, collards, rapini, yellow beans and onion – right into my pan without any prep. To me the best part is the no crying while chopping onion! Before my experience with Cookin’ Greens™, I’d never really used a lot of frozen vegetables in my kitchen, other than frozen corn which is a life saver. However, after my great experience with their frozen produce products, I can definitely see myself including more frozen veggies into my recipes. While you can purchase straight kale, spinach and rapini, it’s the Designer Mix and the Athlete’s Mix that stood out to me because they really reduce prep time and they add another layer of flavour. 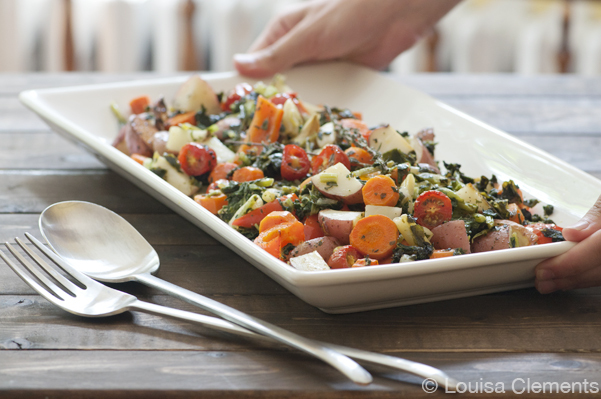 Roasted vegetables aren't just for the winter - cherry tomatoes add a summer touch to a healthy side dish! In a large pan combine Cookin' Greens with other vegetables and thyme. Toss with olive oil. Sprinkle with salt and pepper. Disclosure: I was provided with two coupons for two free packages of Cookin’ Greens. I was not compensated in any other way for writing this post. The decision to write about the product was my own and all opinions are 100% mine. Another delicious recipe for me to make...I am having poker next weekend & I shall be serving this as a veggie dish...Your timing is excellent...Love the photo too!